" பதினோரு வருஷமா இந்த வியாபாரம் பன்னறேன்.. சிவனுக்கும் மூணு கண் நான் விற்க்கும் இளநீர் தேங்காய்களுக்கும் மூணு கண்.. சந்தோஷமா வாழ்க்கை போயிகிட்டிருக்கு.."
ps: Sembulingam is a regular fixture at the corner of CV Raman and Ashoka Road and I drive past him almost everyday from work. 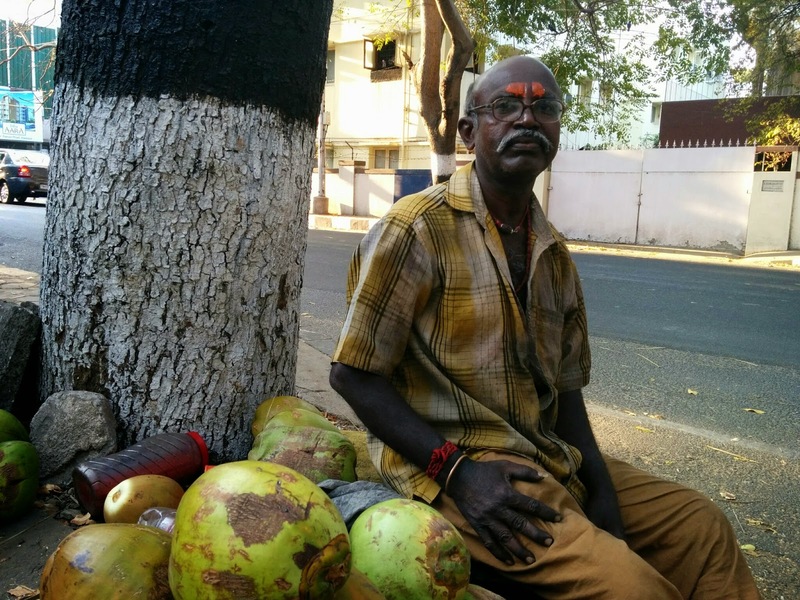 I sometimes stop to buy a ilaneer from him and have a engrossing conversation. Almost always, he will be wearing a bright smile and upbeat about life. He opens his shop bright and early and closes down when his target is met. Thank you Sembulingam for giving me a healthy alternate..